New Guide Offers Coverage of 68 New Models/Systems. As featured on AutoServiceWorld. 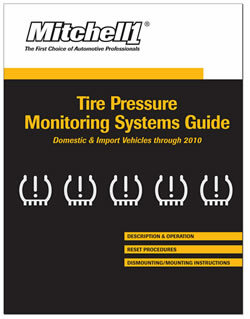 Mitchell 1 announces its 2010 Tire Pressure Monitoring Systems (TPMS) Guide is now available. This 976-page TPMS procedures guide contains updates on previously covered models, as well as includes information on 68 new 2010 models/systems. The 2010 Mitchell 1 TPMS Procedures Guide provides up-to-date information on each manufacturers’ monitoring system including description and operation, reset procedures and dismounting/mounting instructions. This informative guide also includes a quick reference table designed to provide a single point of reference for special precautions during dismounting/mounting of tires. The guide covers all domestic and import vehicles equipped with TPMS through model year 2010.